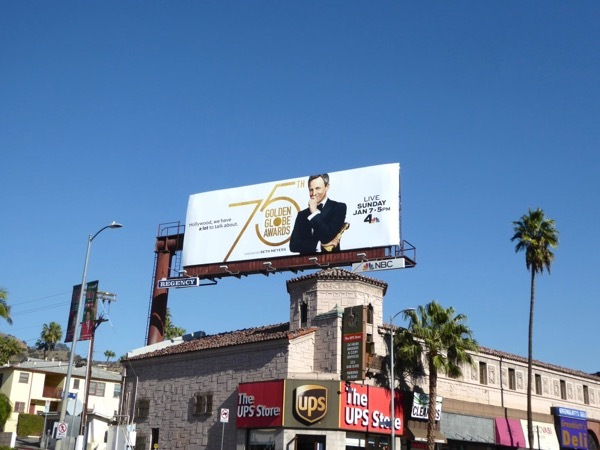 'Hollywood, we have a lot to talk about'. Wow, truer words have never been spoken. From the predatory behavior of actors, studio executives, comedians, TV hosts, directors and producers like Harvey Weinstein, Kevin Spacey, Matt Lauer, Louis C.K. and James Toback to name but a few, the resulting #MeToo and Time's Up initiatives (expect lots of women in black gowns on this red carpet), Trump's continued bashing of the media and the 'Hollywood elite', the proposed Disney and Fox merger and shocking celebrity splits, there's more than enough material for an opening monologue. 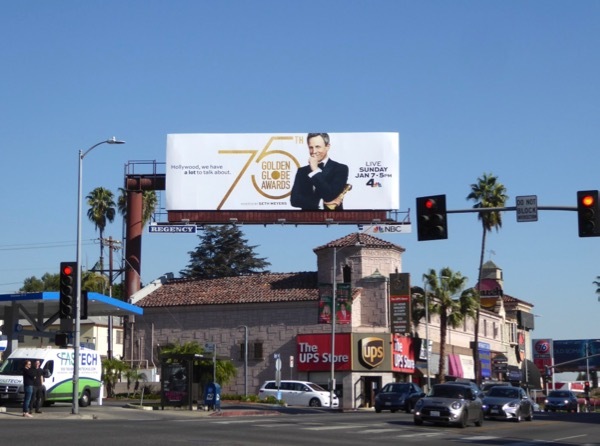 Late-night host Seth Meyers is no stranger to compering awards ceremonies, as this 2014 Emmys billboard illustrates, but how will he handle La La Land's biggest party of the year? 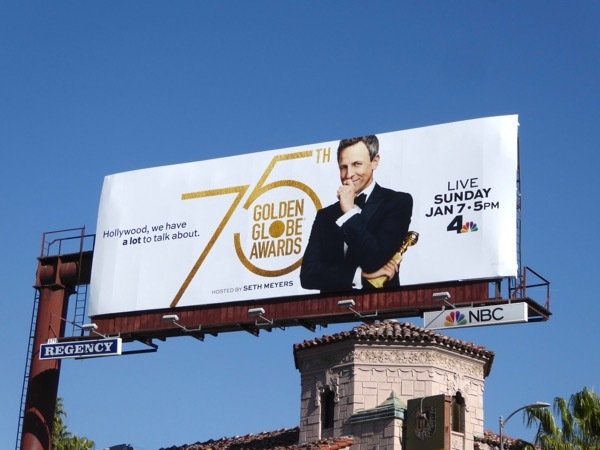 We're sure he'll be taking a closer look at all the big industry news and hot topics of the past days and months. 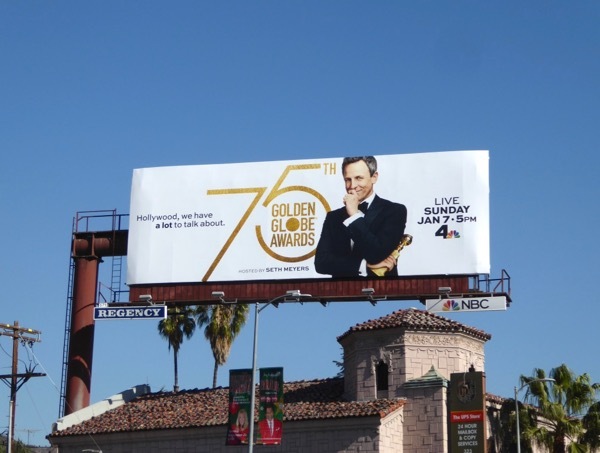 This billboard for the 75th Golden Globe Awards was spotted above Sunset Boulevard at Laurel Canyon Boulevard on December 27, 2017. 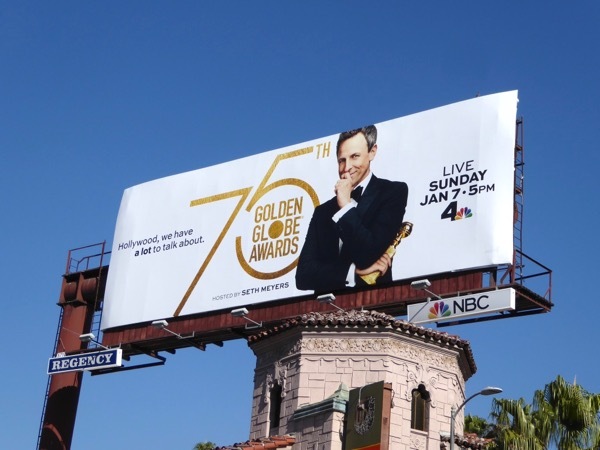 Plus fans of the annual entertainment industry awards show can also enjoy these Golden Globe Awards billboards featuring previous hosts like Jimmy Fallon, Ricky Gervais, Amy Poehler and Tina Fey. Let's hope that whoever the recipients of these awards recognising excellence in the film and television, they remember to thank the Hollywood Foreign Press Association for their golden accolades and not just their agents, stylist and pet hamster from their childhood.